is a WONDERFUL website with a wealth of delightful recipes, tips and ideas. I think my favorite thing is their pictures – full of life and the brimming bounty that life is meant to be. I can almost vicariously catch their joy, as husband and wife team up to duel with kitchen catastrophes and win nearly every time. That said, I will post a picture of my failure or success with this recipe, after I made my slight deviations to “health-ify” the dessert. My criteria for healthy are fairly subjective and strictly based on my own preferences. I like big portions, I want to be able to enjoy quite nearly 1/4-1/6 of a dessert. 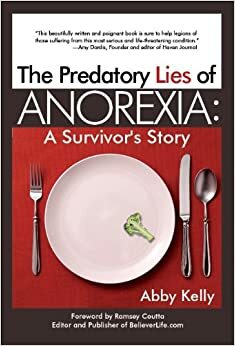 Therefore, the calorie count can’t be terrifying! The recipe can’t be so saturated with carbs and sugar that I feel guilty enjoying it as a bedtime snack. I prefer for my desserts to have a descent amount of protein, in this case, the recipe falls short unless you top it with a dollop of your homemade Greek yogurt. So, wrap up National Blueberry Month with a BIG serving! If you make this recipe using my alterations, you can have 1/6 of the recipe for 218 calories! 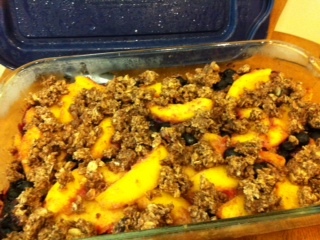 Fresh blueberries and peaches are covered with a sweet crumble topping and baked to perfection! This dessert screams summer! 3. For the crumble topping: in a large bowl, combine the flour, oatmeal, brown sugar, granulated sugar, salt, and cinnamon. Stir together with a whisk. Mix in the butter with your fingers until the mixture comes together and you have big crumbles. 4. Place the fruit mixture in a 2 quart ceramic or glass baking dish. Sprinkle the crumble mixture evenly over the fruit. Place the pan on a baking sheet pan lined with a Silpat or parchment paper and bake for 40 to 45 minutes, or until the tops are browned and crisp and the juices are bubbly. Serve warm or at room temperature. Note-you can make the crumble in individual ramekins. You can also make the crumble ahead of time-just store the unbaked crumble in the refrigerator and bake when ready! Store the crumble in the refrigerator for up to 2 days.